Looking for a more beautiful but practical side table? 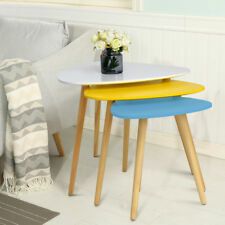 Homfa 3 sets side tables is definitely the best choice for you! A unique modern design offers a beautiful sight, it must being a attractive coffee table, nesting table or bedside table in your room. Homfa side table This table with triangle design has a sturdy construction, 3 metal legs for each table ensures the stable using, table surface is is very smooth, easy to clean and maintain. The table can be used in your living room or bedroom to place drinks, snacks, newspaper or some other home accessories, making your home looks more stylish and neat. Features:. Household Supplies & Cleaning. Colour: warm white. Yard, Garden & Outdoor Living. Kitchen, Dining & Bar. Elegant color and stylish modern design make it a great decor for your house. Perfect tables for living rooms, bedrooms, or any space where an extra surface is needed. ➤ ALWAYS BY YOUR SIDE: Want to keep your glass of wine close by while reading a book, or need a table lamp at your bedside during the night?. Simply one set can provide everything you need within reach with the 3 practical tables. Design Concept & The Features of This Nesting Coffee / End / Side Table Industrial Style Design, Ideal for giving rooms a fashion spirit and adding a professional style to offices. Since 2015, we are devoted to produce the most fashionable and valuable Furniture. 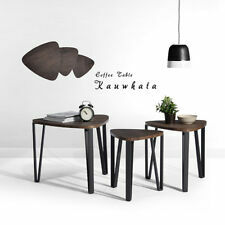 Design Concept & The Features of This Nesting Coffee / End / Side Table: Practical three-piece design, can be put separately, also can be stacked Easy to Assemble, Store and Clean Stackable placement, take a small size to big space utilization Industrial Style Design, Ideal for giving rooms a fashion spirit and adding a professional style to offices The size of nesting coffee table, transformed, a few friends can sit down and drink coffee together. Tables Information DIMENSIONS : 21.9*21.9*17.8In (Large); 17.3*17.3*16.7In (Middle) ; 14.1*14.1*15.9In (Small); MATERIAL :Iron tube, MDF boards with PVC surface; PACKING WEIGHT: NW: 20.7 lbs, GW: 24.3 lbs; PACKAGE INCLUDES:* Carton * Instruction for installation * Polybag *Screw *Components. No matter if you use them as coffee tables, side tables or simply as decoration. These Modern Nest Of 3 Tables match nearly any room with their subtle and modern design. A high quality multi-use item. 1×Assembly stool. Colour: White. Great for the Living Room, Den, Office & More. Material: MDF Wood Legs. Large Table: 55×47.5×45cm Approx. Small Table: 35×31×38cm Approx. We believe we can make you satisfied. 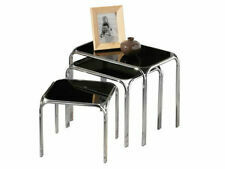 Retro style nest of three tables. NEST OF 3 TABLES. Practical yet stylish when you have guests and need an extra table for that glass or cup of tea. Large: H45 x W65 x D65 cms. The set includes three colors——White, Yellow and Blue, making it very eye-catching in your room. Retro Colored Nest Of Tables. Colour: White, Yellow, Blue. The set needs easy self-assembly. Nest of 3 Black Glass Table. SUPER BRIGHT SOLAR POWERED DOOR FENCE WALL LIGHTS LED OUTDOOR GARDEN LIGHTING. NEW 6 SECTION CANVAS STORAGE BOX WARDROBE ORGANISER DRAWER ORGANISER SOCKS TIES. Food & Drink. With smooth curves and a refined look, the wedge shaped nest of three tables is perfect for bringing your living area into the modern era. The nest of tables are a great addition to the party making sure that you have enough table space for drinks and snacks. SET OF 3 NESTING TABLES. LARGE TABLE: Height : 43cm X Width : 48cm X Depth : 48cm. Aingoo set of 3 brown wood coffee nesting tables brings you stable comfort both indoors and outdoors with its clean and natural design. Set of 3 Nesting Tables. [EASY TO CLAEN AND ASSEMBLE]---Nesting tables with the smooth surface, you can easily clean the Sofa Table with a cleaning cloth. EASY TO CLAEN AND ASSEMBLE ---Nesting tables with the smooth surface, you can easily clean the Sofa Table with a cleaning cloth. The assembly instructions are very easy to follow and no need for any special tools to use. The assembly instructions are very easy to follow and no need for any special tools to use. Also can be used indoor or outdoor. Why Buy From Us?. 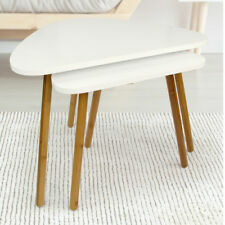 Wooden Side Nesting tables with the smooth surface, you can easily clean the Sofa Table with a cleaning cloth. The assembly instructions are very easy to follow and no need for any special tools to use. STYLISH LOOK. Side tables with Clean lines and stylish design compatible well with any decor of your room, perfect combination with other furniture accessory. Also can be used indoor or outdoor. Feature wear-resisting foot pad to protect legs wear and tear, while protecting the floor. Colour Dark Brown. Stylish design compatible with the decor of any room, can be used indoor or outdoor. Smooth curved corner round edge makes it safe for kids. TheseIndustrial Nesting Tables tuck in one under another, making them perfect for small spaces. These nesting tables are stylish & decorative. Industrial Nesting Tables. The tables need self-assembly. And the brown wood effect with black legs looks natural and clean. Such classic small tables fits great with all architectural styles. Aingoo set of 3 brown wood coffee nesting tables brings you stable comfort both indoors and outdoors, just like in the nature. Colour: warm white. Elegant color and stylish modern design make it a great decor for your house. Perfect tables for living rooms, bedrooms, or any space where an extra surface is needed. Small Table: 35×31×38cm Approx. EASY TO CLAEN AND ASSEMBLEWith the smooth surface, you can easily clean the Sofa Table with a cleaning cloth. 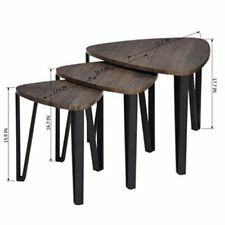 The assembly instructions are very easy to follow and no need for any special tools to use.Aingoo set of 3 brown wood coffee nesting tables brings you stable comfort both indoors and outdoors, just like in the nature. The surface of each table has a curved triangle shape, the black glass producing a contemporary look. Designed to nest snugly, place them beside a sofa in the living room. Nest of 3 Black Glass Tables.